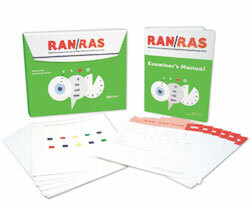 The RAN and RAS are considered to be the "gold standard" of naming tests, reflecting over 30 years of clinical research examining the relationship between reading and processing speed. Children find the tests simple and fun - what could be easier than naming the letters, colors, objects, numbers, or sets of letters, numbers and colors? Practitioners find the time it takes to recognize and name visual symbols to be a quick, valid, and reliable predictor of oral and written language proficiency. 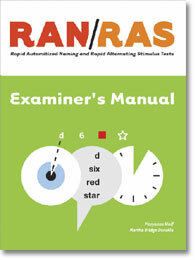 RAN/RAS can be administered in a total of just 5 to 10 minutes. Scores (based on the time it takes to name the items) are reported as standard scores and percentile ranks; age-and grade-equivalents are also provided.